M. Night Shyamalan's super-dull superhero trilogy comes to a rip-snoring conclusion in this supposed paean to comic books that lacks thrills, humor, fun and human interest. Way back in 2000, Shyamalan followed the overwhelming critical and commercial success of The Sixth Sense with Unbreakable. With its slow-simmer story about a man with superhero powers, the movie received a chilly response. Since then, Shyamalan's career has been a roller-coaster of success and failure. Back on the commercial uptick with the rather silly thriller The Visit in 2015, Shyamalan gained more steam in 2017 with Split. As it turns out — at least as Hollywood lore would try to have it — Unbreakable was always intended to be the start of a series, a low-key (but big-budget) forerunner to the Marvel Cinematic Universe. Given Unbreakable's lackluster reception, the "series" was shelved until Split got things back on track. All of a sudden, David Dunn (Bruce Willis, Die Hard) was thrust back into action. And a series was reborn. Glass is remarkable for this one, singular accomplishment: it actually makes the preceding installments even less satisfying. It's interminable filmmaking with abysmal pacing and a conclusion that circles the drain, straining to get characters to make one last "statement" about the human condition. It's all so painfully derivative — with Shyamalan demonstrating merely a rudimentary appreciation of comic books — and it adds virtually nothing new to the genre. O what could've been. This could've been quite a statement on modern society, human rights, equality and social media. Shyamalan has a penchant for the lowest common denominator while mimicking what he sees in the theatre. This is a dull, borderline-depressing superhero story very much on par with Zack Snyder's overly serious take on the DC universe. The conceit initiated in Unbreakable has devolved to the notion comic books are actually documents of real events in the real world. Think Watchmen. Better yet, think The Incredibles (and watch that one instead). Casey Cooke (Anya Taylor-Joy, Thoroughbreds), who survived The Horde (James McAvoy, Wanted) in Split, has the proof comic books tell true stories: Metropolis is actually New York City! OMG! Thanks, Casey. And did you know that, while DC's Metropolis is indeed a play on Manhattan, Marvel's New York City is based on... um... New York City? It's all an embarrassment of really bad storytelling that teases a climactic confrontation between Mr. Glass, David Dunn and The Horde at the newly-opened Osaka Tower — the tallest building in Philadelphia (and a marvel in sustainability, according to the incessant TV news reports) — only to fail to get out of the parking lot of the mental health hospital where the bulk of the movie takes place. Reportedly shot for a mere $20 million, Glass is low-budget tripe that's sure to generate a modest profit and keep Shyamalan happily churning out more movies that attempt to recreate the Twilight Zone magic of Sixth Sense's big surprise ending. This one strains its reach. Just as nobody expected Split to morph into a comic book movie, nobody expected — or could honestly care about — what is forced into the storyline as a supposedly major revelation regarding one of the main characters' back story. The drama further gives way to silly chatter between Mr. Glass and his mom about "limited edition" comic books and their blockbuster conclusions. This one, Mr. Glass states emphatically, is an origin story. It's all just a garble as Shyamalan tries to make something profound out of nothing. The sole bright point is the performances are fine. 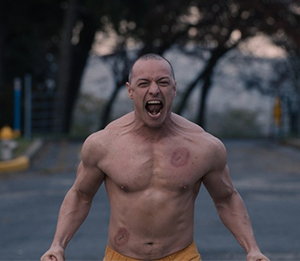 As with Split, McAvoy steals the show. Willis looks good as the aged David. As for Jackson, it's nice to see him sit in a drug-addled silence for most of the movie. He's been such a once-note caricature the past several years, that silence is golden while he sits in his wheelchair (no doubt, it's the one with "Bad Mofo" on the back). And it is a nice touch to see Spencer Treat Clark reprise his Unbreakable role as David's son. The shame of this mess is there is a rather nice message lurking beneath the junk. There's the idea that people limit themselves from becoming superheroes — but it's also the same through-line that was told exponentially better in Christopher Nolan's Dark Knight trilogy. Split ended with the promise of mayhem and a whack-a-doodle climactic conclusion to this newly-rebirthed series, but Shyamalan fails to deliver here. There's nobody to really care about and the potential gold mine of comic book lore and mythos — the possibility to go for the gusto and create a looney festival of conspiracy theories and secret agencies — crumbles as Shyamalan — in typical Shyamalan fashion — gets in his own way. Yes, there's yet another awful speaking-role cameo for Shyamalan; perhaps his lack of acting chops explains why so many other characters react to major plot points in a most unrealistic fashion. For one, Casey feels compelled to visit Kevin at the hospital. With one cold stare at Dr. Ellie Staple (Sarah Paulson, Ocean's Eight), she not only gets to visit Kevin, she touches him. Which provides Dr. Staple with this revelation: the antidote to Kevin's loveless life is Casey's affection. Eww. Gross. And, later, there's an unlikely alliance that forms. It's an alliance built on the same frail "Martha" logic of Batman v. Superman: Dawn of Justice. It's like those old insurance commercials with a woman posting photographs on the wall at her home and thinking she's interacting with Facebook's wall. No. That's not how it works. That's not how any of it works.